The federal committee charged with creating nutrition guidelines for Americans is calling for fat interventions at workplaces. During a presentation at the sixth meeting of the 2015 Dietary Guidelines Advisory Committee (DGAC) on Friday, the committee said government needs to take "bold action" to fight obesity. The solutions included "comprehensive" obesity interventions in "health care, the community, public health facilities, and work sites." "The public should monitor body weight and engage with providers in evidence-based approaches aimed at achieving and maintaining healthy body weight," the panel said in a presentation on "Food and Nutrient Intakes, and Health." The committee, which is responsible for creating new nutrition standards that are used to create policy at the federal level, has previously called for moving Americans to "plant-based" diets, and using text message interventions to get people to lose weight. "Bold action is needed to confront the Nation’s obesity epidemic and its devastating metabolic consequences," a slide said during the presentation on Friday. "Quality of care guidelines need to be revised to incentivize personalized lifestyle and nutrition interventions." The committee said it is "imperative" to create obesity interventions that would bring in "trained interventionists and professional nutrition service providers" for "delivery in multiple settings." 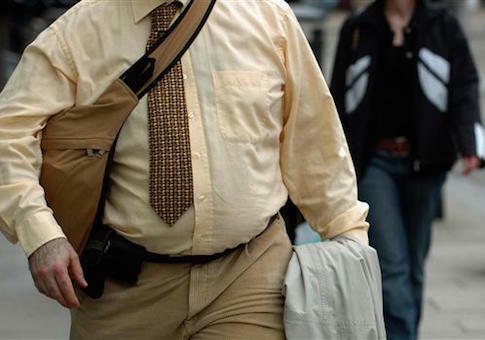 The panel claimed that 65 percent of adult females and 70 percent of adult males are overweight or obese, and argued that "environmental strategies" are needed to fight obesity. "Complement health care and public health initiatives with collaborative programming in agriculture, retail, educational, and social service settings lifestyle for long-term adoption of health nutrition and lifestyle behavior," read one recommendation. Dr. Barbara Millen, the chair of DGAC, said obesity interventions must be expanded beyond health care settings. "It’s pretty clear in a public health model with focus on the individual as well as the populations that all of this cannot be accomplished in a health care setting," she said. "It really will take a broad strategy across environments … not only traditional health care, community settings. And these can’t be a siloed approach but across sectors to be effective." Dr. Anna Maria Siega-Riz, a nutritional epidemiologist at the University of North Carolina at Chapel Hill, agreed and called for more monitoring of children’s weight, and for mandatory doctors visits. "I was pretty much stunned, though I’m quite well aware of the chronic health care outcomes for young adults and preadolescents," she said. "The more we can do to call for really bold action among these groups in a meaningful way of trying to combat this." "Not just going with schools, but when we think about the health care system, there are very little check ups required for kids," Siega-Riz said. "We can make a strong call for more monitoring and help for this population before they actually carry out these outcomes for the rest of their lives." The committee continued to push for American’s to consume less meat, and recommended the Mediterranean diet, which consists of eating primarily plant-based foods. Siega-Riz’s presentation recommended "lower consumption of red meats, moderate intake of alcohol, [and] low intake of sugar-sweetened foods and drinks." "The U.S. population should consume dietary patterns that are: rich in vegetables, fruits, whole grains, low-fat dairy, fish/seafood, legumes, lean meat, and nuts," a slide said. The committee has been criticized for putting environmentalism over food science. Angela Tagtow, who was appointed to oversee DGAC this summer, has called for "social justice" in food policy and says she takes an "ecological" approach to nutrition. This entry was posted in Issues and tagged Health Care, Obesity. Bookmark the permalink.